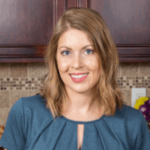 Published: Nov 27, 2017 · Modified: Apr 11, 2019 · By Jen Sobjack · This post may contain affiliate links. 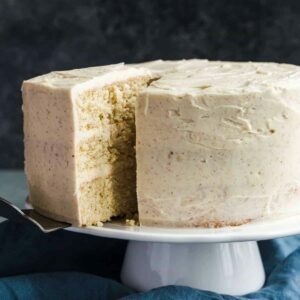 Eggnog Cake with three layers and a boozy soaking syrup! So decadent and rich, topped with silky buttercream spiced with cinnamon and nutmeg. This dessert is way too delicious to pass up this holiday season! This post has been sponsored by Promised Land Dairy for the #FarFromOrdinaryMilk campaign. All thoughts and opinions are my own. 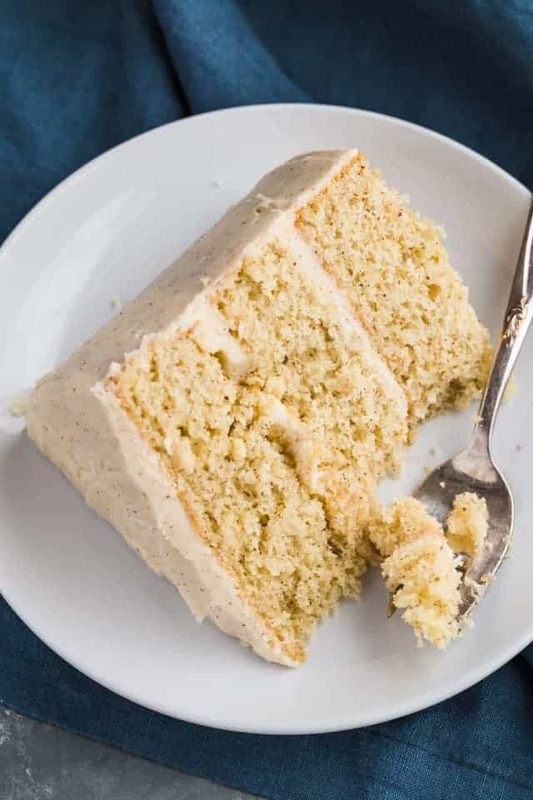 Eggnog Cake! Need I say more? Eggnog is looked forward to every year in my house. We love sitting by the fire with a mug of eggnog spiked with bourbon. It’s so cozy and simply the best way to end a cold winter day. This showstopping 3 layer cake combines the comforting flavor of spiked eggnog with a tender cake for the ultimate dessert. It’s going to be the talk of your holiday parties, for sure. With Christmas just around the corner, all I can think about is dessert. I mentioned before that I’m going home for the holidays and I plan to contribute to the family party by bringing dessert. And what’s a better dessert than eggnog cake for Christmas Eve with family? It’s very easy to make this cake and everything can be made in advance to save time. That’s always a bonus! The cake layers are adapted from my basic vanilla cake recipe. 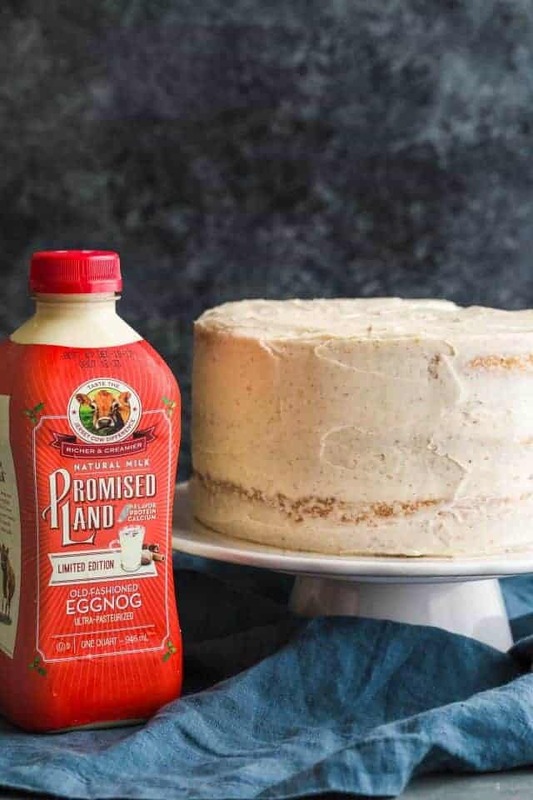 I used one of my new favorite products, Promised Land Dairy Old-Fashioned Eggnog in the batter. It has a hint of spice and irresistible taste that’s made for the holidays. To keep the cake light, I separated the eggs and whipped the whites to stiff peaks before adding them to the batter. This makes the cake soft and spongy so it will absorb the boozy eggnog soaking syrup. I used bourbon in the eggnog soaking syrup because we like our nog spiked. You can use vanilla extract in place of the bourbon or just omit it altogether. Either way, you’ll have a fabulous tasting cake. The cake is layered and frosted with my favorite buttercream recipe. I use this basic vanilla buttercream as a base for almost all my frostings. It has more butter than powdered sugar, which is the opposite of what you usually see in a buttercream recipe. The trick to getting the perfect texture is to make sure the butter isn’t too soft. I like to set it out for about 30 minutes before I need to use it. It shouldn’t be so soft that it’s shiny. But it should be soft enough to squeeze while still holding its shape. Promised Land Dairy Old-Fashioned Eggnog is added to the frosting to help make it silky and smooth. It really is such a great way to elevate classic dessert. The creamy taste makes a great addition to favorite holiday dishes. 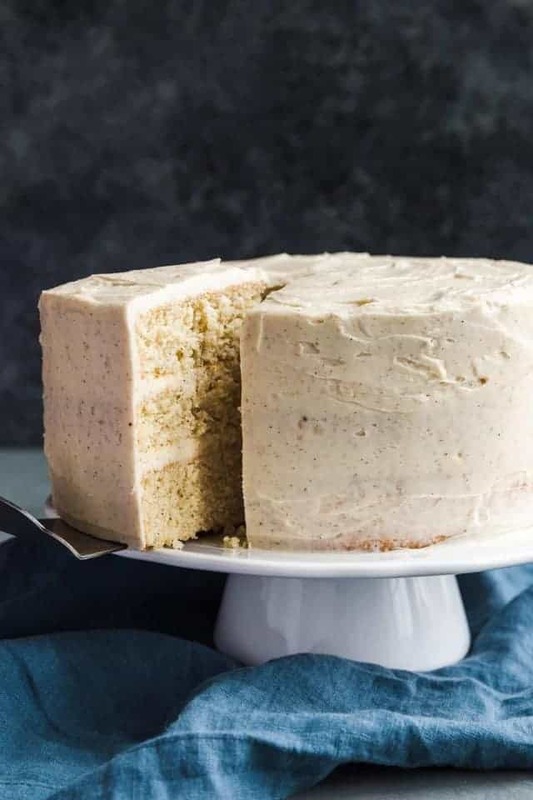 Take your holiday baking to the next level with this flavorful eggnog cake! NEED MORE BAKING IDEAS? Subscribe to our newsletter and follow along on Facebook, Instagram, and Pinterest for all the latest updates! 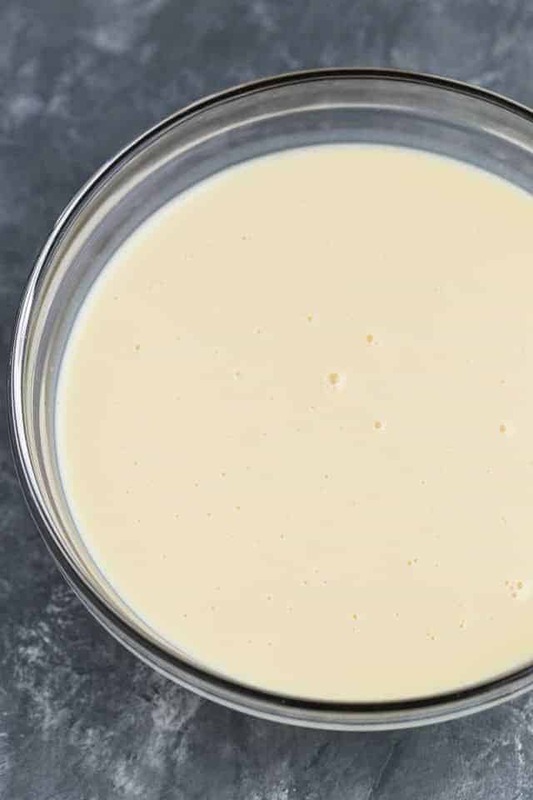 In a small bowl, add the condensed milk, eggnog, and 1 tablespoon of bourbon. Stir until well combined. Add an additional tablespoon of bourbon if a stronger flavor is desired. Set aside. Preheat the oven to 350°F. Lightly grease and flour 3 8-inch round cake pans; set aside. In a medium bowl, whisk the flour, baking powder, salt, cinnamon, nutmeg, and cloves together until well combined. 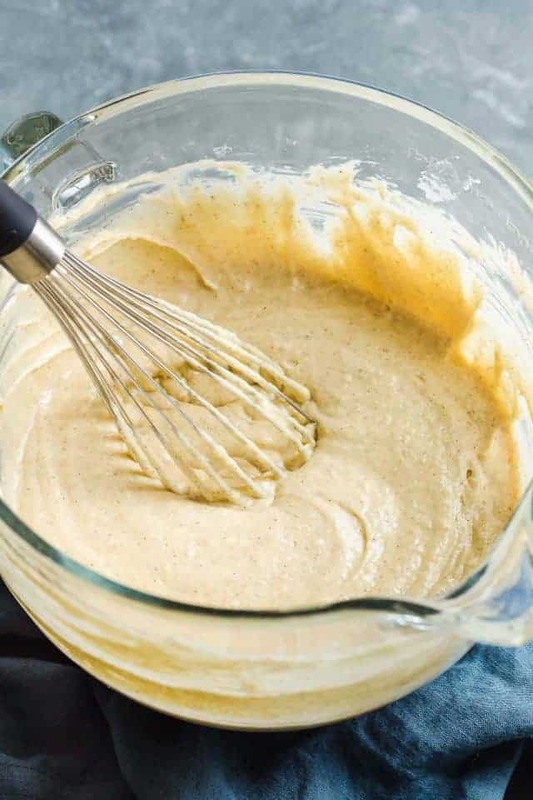 In the bowl of a stand mixer fitted with the paddle attachment or with a hand-held mixer, beat butter and sugar together until light and fluffy, about 5 minutes. Add the egg yolks, one at a time, mixing well after each addition. Beat in the vanilla. With the mixer on low speed gradually add the flour mixture in 3 additions, alternating with the eggnog. Mix well after each addition. In a separate clean bowl, beat the egg whites to stiff peaks. Fold 1/3 of the egg whites into the batter, then gently fold in the remaining egg whites. Divide the batter evenly among the prepared pans. Use an offset spatula to spread the batter all the way to the edges and smooth the top. Bake for 15-25 minutes or until a toothpick inserted into the center comes out clean. Take care to not over-bake. Check the cake at 15 minutes to see how it is doing and judge the timing from there. Cool in the pan on a wire rack for 5 minutes. 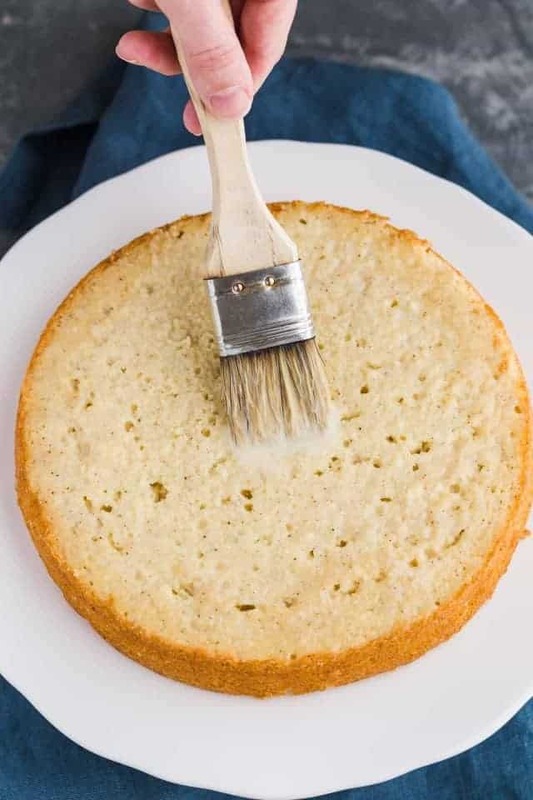 Use a fork, bamboo skewer, or chopstick to poke holes in the top of each cake. Drizzle the bourbon eggnog syrup evenly over each layer. Let the layers sit in the pan for 5 minutes then invert the cakes onto a wire rack to cool completely. 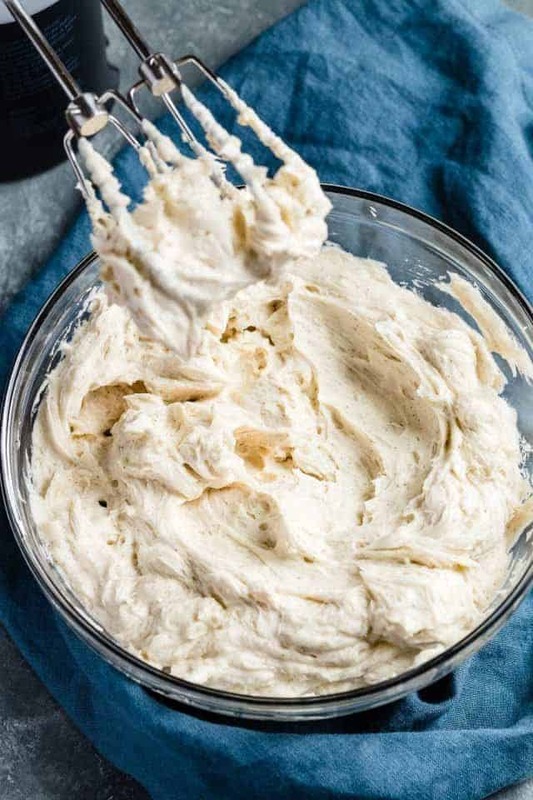 In the bowl of a stand mixer fitted with the paddle attachment or with a hand-held electric mixer, beat the butter on medium-high speed until light and fluffy. Add vanilla, cinnamon, nutmeg, and salt. Continue to beat until incorporated. Add 2 cups of the confectioners’ sugar, beat on medium-low speed until most of the sugar is moistened, 3-5 minutes. Add the remaining sugar and beat for another 3-5 minutes, until well incorporated. Beat in the eggnog, one tablespoon at a time until the frosting reaches a soft spreadable consistency. Place one cake layer face up onto a serving platter. 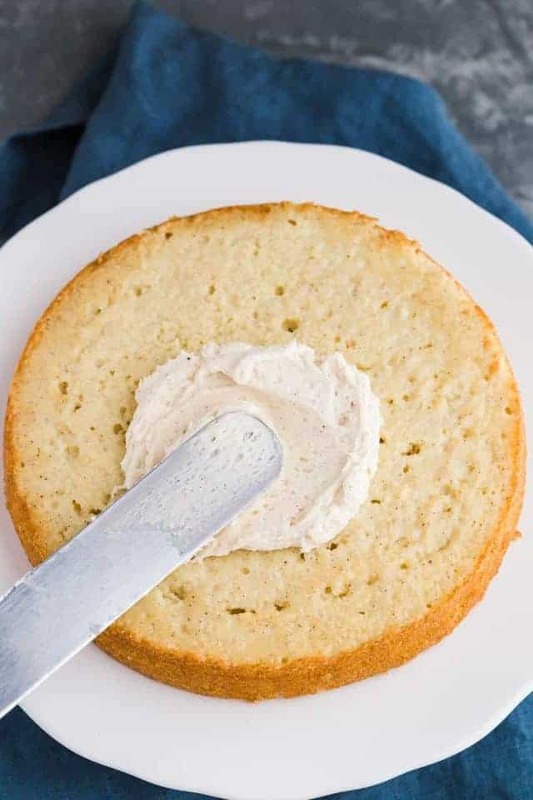 Spread a thin layer of frosting evenly over the cake. Add the second layer face up and spread a thin layer of frosting over the cake. Add the third layer, top-side down, and frost the top and sides of the entire cake. Cover and store the cake in the refrigerator for up to 4 days. Wrap the baked and cooled cake layers in plastic wrap and store them in the refrigerator. Assemble and frost the cake within 2 days. Bourbon syrup can be made ahead and stored in the refrigerator for up to 3days. Frosting will keep for up to 4 days stored in an airtight container in the refrigerator. Let stand at room temperature to soften before use. Since different brands of ingredients have different nutritional information, the values shown are just an estimate. Tried this recipe? Share it on Instagram!Mention @introvertbaker or tag #bakedbyanintrovert! Hi – can I substitute spiced rum for the bourbon? Also, am I able to use all purpose flour or should I definitely use cake flour? Hi Meg! Spiced rum would be fabulous. Go for it! And definitely use cake flour since the recipe was developed using that particular flour. If you absolutely must use all-purpose flour, I suggest adding cornstarch to mimic cake flour. I have an entire article dedicated to this topic – Homemade Cake Four. This cake looks and sounds amazing! This cake looks fantastic! I love a good spiked cake and eggnog is the best flavor for that!! This is such a gorgeous cake! The cake looks so soft and fluffy and that icing looks so creamy! I bet this is AMAZING! This looks incredibly festive and tasty! Boozy Soaking Syrup has to be the BEST words to go together in the English language. I love eggnog but I’ve never consumed it in cake form before! I bet my eggnog loving family would flip if I made this recipe! Looks awesome! Jen, I do not see oil listed in the cake ingredients, but it is mentioned in making the batter. Could you please help me out with this? I would like to make this wonderful cake but I need to make certain of the ingredients. Oh dear! That’s a huge mistake. I tested this recipe a few different ways and clearly got confused by my notes. I’ve updated the method to show the correct process and no oil is needed for this recipe. Thank you so much for bringing this to my attention!! This cake! From the eggnog soaking syrup to the buttercream, totally luscious. 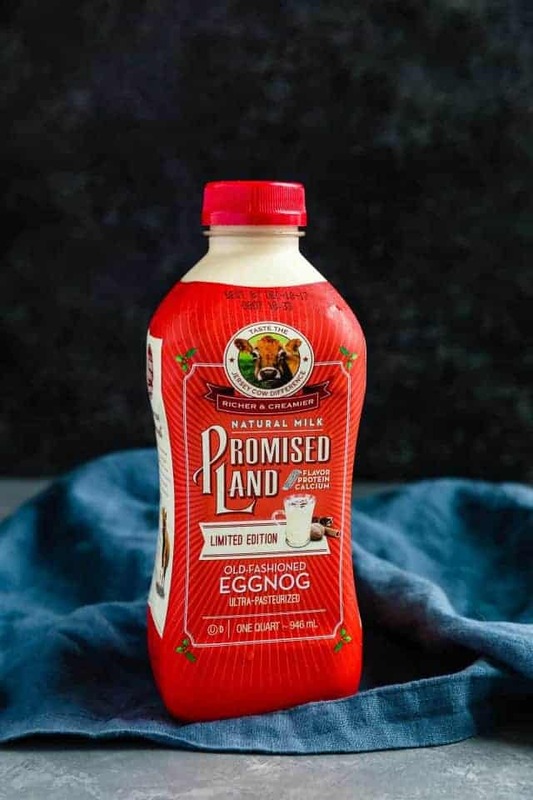 I haven’t seen this brand of eggnog before – will keep my eyes out for it. Eggnog is my hubs’ fav! I can’t wait to whip this cake up for him! The moments I treasure most are those spent quietly in my kitchen, creating the best tasting dessert recipes so I can share them with you.